Size 0 - SHIPS FREE! Size 1 - SHIPS FREE! Size 2 - SHIPS FREE! Size 3 - SHIPS FREE! Size 4 - SHIPS FREE! The Boris Shower Commode Chair, manufactured by Clarke, is a shower chair in five different sizes most suitable for children up to young adults. 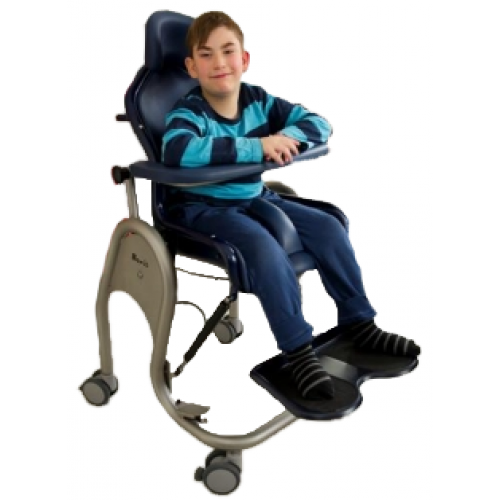 The degree of tilt can be easily be adjusted using the foot pedal and with tilt-in-space positioning even the maximum 30 degrees won't compromise the balance of the chair. The strong, durable, and attractive stainless steel frame features a molded plastic shell which is easy to clean, and the casters on the feet can lock to prevent rolling. The chassis can be rolled over a toilet or you can use the optional commode pan for standalone use. 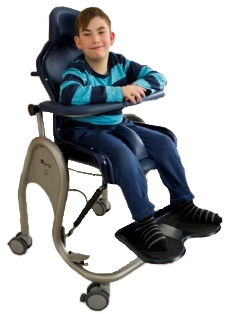 Also available are optional accessories which can provide more options for positioning and support for the user. Please see the table below for size and weight capacity information. For adults you may try the ShowerBuddy Roll-In Buddy Tilt Shower Transfer Chair, or the Invacare Mariner Rehab Shower Commode Chair. Gas pressure spring tilts to any angle up to 30 degrees.